Growing tomatoes allows you to eat the juicy, vine-ripened fruits tomatoes right off the plant or add them fresh-picked to recipes. 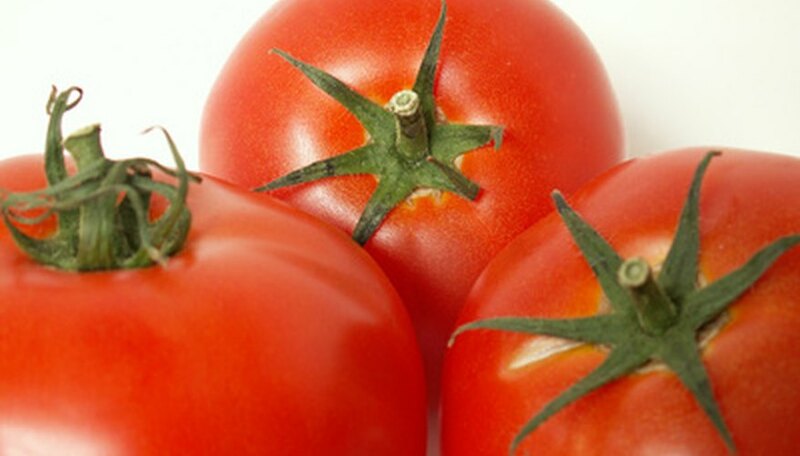 You do not have to own a yard, garden or even a balcony or patio to grow tomato plants. You can grow tomatoes inside your house in containers or pots; tomatoes grow well indoors, as long as basic requirements are provided. Place containers in locations inside your house that provide full sun for at least 6 hours a day. Use pots that are at least 16 inches deep and have drainage holes. Five-gallon pots work well for growing container tomatoes. Cover the drainage holes with mesh, a paper towel or old coffee filter. Fill the pot with a top-quality potting soil or soil mix. Use a growing medium that includes a time-released fertilizer, or add fertilizer, as directed, to each container. Dig a hole and plant one tomato in each container. Drench the tomato plants with water after planting to remove air pockets and settle dirt around the root system. Place a tomato cage or other support in each of the pots at planting time, or shortly after. Installing tomato cages after the roots develop can damage the roots. Apply a water-soluble fertilizer, mixed at half strength, two to four weeks after planting tomatoes, suggests the University of California. Reapply again every two to three weeks throughout the growing season. Check the tomatoes daily to see if the soil remains moist. Water the tomatoes until the water comes out the bottom of the pot when the top inch of soil is dry. Allow the tomatoes to grow on the vines until fully ripened. Ripe tomatoes come off effortlessly when pulled. Turn the growing tomato plant's containers weekly. This will keep the tomatoes' growth even on all sides.